In the final instalment of our preview series, we cast an eye over Honda, the home of the reigning world champion. It came as a great relief to all wearing shirts embroidered with the HRC logo to learn of Honda's decision to ditch its scriptures of old, and place complete and total faith in the big bang. For 2017 marks a departure from the old. Gone is HRC vice president Shuhei Nakamoto, now retired from racing involvement. And standing trackside reveals the factory has chosen a different route for its engine development. Less rasp. A deep-bass boom. For so long riders have pleaded for a bike that is easier to ride. A new, 'big-bang' style engine configuration has aimed to do just that. However, to listen to Marc Marquez, Cal Crutchlow and Jack Miller on the final evening of preseason testing, one could be forgiven for thinking HRC had dug its own hole all over again. 'The bike is losing so much in acceleration,' they said. 'We have to make up all the time on the brakes'. So much so, riders were pushing the front to and beyond its limits. Crashes were commonplace, with Marquez having the scuffs to prove it. Five falls across three days, with three of those coming on the final evening. But take a step back, and view the winter as a whole and there can be no doubting HRC is in much stronger shape going into 2017. The Qatar test, it seems, was a blip on the preseason map. Until then, Marquez had wowed onlookers with a new-found consistency that shocked Maverick Vi?ales into upping his own game over the winter months. Dani Perosa appears to be a man revitalised, his confident demeanour and testing times proving that he is surely 2017's dark horse. And Cal Crutchlow, twice victorious last year, hasn't been outside the top ten at each of the four tests. "For sure we can be happy," said team principal Livio Suppo at the close of testing in Qatar. "For Marc today was a bad day. That can happen. But the rhythm is there and the bike has improved. All winter tests for Dani have been positive. I think if we see the global picture of the whole winter tests we can be reasonably happy." A year ago, HRC found itself in a mire partly of its own making. Its new engine was barely any easier to ride than the previous model. Engineers found the transition of learning how to programme the new Magneti Marelli electronics software painfully slow. Pedrosa's dealings with the media were restricted to a handful of words. The 'satellite' bikes were nowhere. The list didn't stop there. Had Marquez's genius not been ever-present the consequences of a dire preseason would have been much, much worse. Nonetheless, in spite of its overall success, HRC has taken past experiences on board, and has adopted a more clear-sighted approach in the winter of '16-17. And that in spite of a considerable internal re-organisation in the wake of Nakamoto's retirement. Three men step into fill the considerable void: Tetsuhiro Kuwata-takes on administrative duties, Shinichi Kokubu presides over the technical side while Naoki Hattori is dealing with the business aspect. Honda has used its limited test days wisely, opting to put Jack Miller in the factory test team in November for a run out at Jerez, to acquire more information on the first of the two new engines riders have tested. 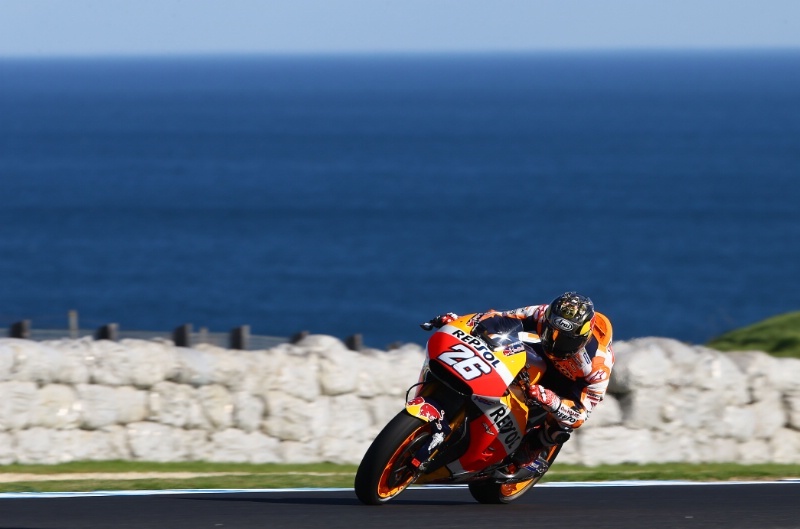 After the three days at Phillip Island, Marquez and Pedrosa returned to Jerez for a final confirmation that the newer of the two motors was indeed the right way forward. Caught out by the rule that freezes engine development from the first race in the past two years, you can't accuse the factory of not being thorough this time around. Honda riders have been notoriously tight-lipped when detailing the feel of the new engines at each test. The first, which riders tried at Valencia in November was certainly smoother in the low rev range, making it all more manageable for its riders. "It's just smoother and seems a lot more user-friendly," commented Miller. "It's more calm for the rider and you can focus more on hitting the lines rather than battling to keep the bike in a straight f**king position." However, outright speed was sacrificed, and it appears the newest motor with the same configuration that Repsol riders (and Crutchlow) have used since Sepang, has beefed up that aspect. As a result of this increased power, the final bike appears to be less easy to ride. "We were a little bit back to fighting with it," said Miller after trying the newest engine for the first time in Qatar. Crutchlow is also of the opinion that this is even more difficult to ride than what he had a year ago, when attempting to push the bike to its limits. "It's the same old story with the Honda. Me, Marc and Jack are really struggling with the front. Dani's not because, as we know, he's so much lighter. Now we're going faster and we're finding the [limits] again," he said. "And don't forget, nothing has changed. The engine has changed but nothing else. It makes it a little bit difficult." That and Honda hasn't addressed its main weak point from a year ago - acceleration. Hence the need for the late-braking heroics at Qatar. However, whatever the riders say, the bike is still fast. And consistent to boot. Marquez's pace in Valencia, Sepang and Phillip Island was awe-inspiring to put it mildly. "I'm very consistent, I'm quite fast but still there is something I don't understand," he said in Australia. "It's true. I feel not so good with the bike but then I pass the finish line and - bam - I see the lap time. And yeah, it's coming. If I feel already on the limit I would say. I'm riding fast and pushing myself, but still on the bike we are missing something." Suppo feels the consistency is because of a variety of factors: "It's a combination," he told Crash.net "For sure, the bike has improved as I think Dani and Cal's performances show. Tito has been injured and is difficult to judge, but Jack, in terms of rhythm, is not bad. 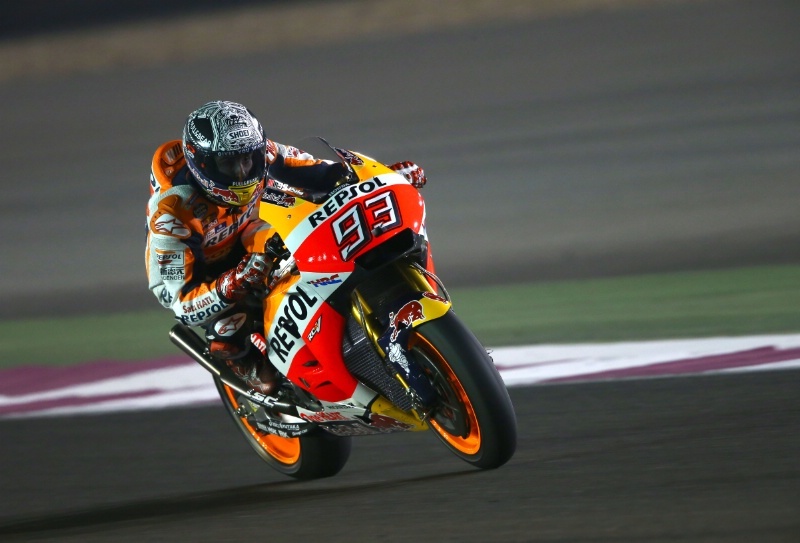 Marquez muscles the '17 RC213V around Qatar, a test during which he suffered five falls. pic: Gold&Goose. "I think the machine is getting better. With one year of more experience the engineers are more familiar with everything. The new engine helps. If you listen to the riders it looks like the bike is a little more smooth and a bit easier to ride. We are ready to start." It is worth noting that it has taken each rider some time to re-adjust the electronics settings (engine mapping, traction control, engine braking etc) to the new characteristics of the engine at each circuit. By the second evening in Qatar, for example, Crutchlow was still encountering issues, finding the electronics to be erratic on occasion. With the Repsol team having collected vital information at four circuits, each differing in character greatly, Suppo doesn't foresee this hampering Honda's riders as the race weekends approach. "We've been testing in four different circuits now because we were testing also in Jerez. Only one day but we were there and I think it won't be a big issue." It took a playful nudge from Marquez to remind him of Pedrosa's capabilities, which, after that stunning duel in Misano six months earlier, shouldn't have been an afterthought. "Ah yes, of course. Also Dani!" Rossi added. He hasn't been the only one to forget - albeit fleetingly - Pedrosa's capabilities. Could Dani Pedrosa be the dark horse of 2017? pic: Gold&Goose. A long road back it may have been, but Pedrosa comes into 2017 in his best shape since, arguably, 2013. A clean bill of health is a massive bonus. He has a new crew chief in Giacomo Guidotti, a new personal manager, a new helper in Edu Villodre, and a new rider coach in ex-race winner Sete Gibernau. "You have to find a way to adapt to the times, either with your riding and also outside of it," he recently told Spanish journalist Manuel Pecino. "One of the important points is to find those other areas that you haven't covered as much, and I'm now looking for reinvention in that area. I am happy with the changes I've made." Those testing performances are not to be sniffed at either. OK, Marquez has shown superior race pace and consistency. But even the reigning champion can't boast of a preseason scorecard that reads: fifth, fifth, third, third. Remember when everyone felt Pedrosa's point-and-squirt riding style was tailor-made for Michelin rubber? Well, now he has a machine capable of utilising that to the full. One can only think the premature report which emerged after he broke a collarbone at Motegi and hinted at his possible retirement has served as a fine motivator to get back toward his best. As for Honda as a whole, it goes into 2017 with three riders more than capable of winning races. Which other factory can claim that? And if Marc Marquez was able to succeed in the wake of last year's mess, just what will he be able to do on a package that is relatively well-sorted? Vi?ales and Rossi will provide a stiff test, but there is reason why he remains the favourite for a fourth premier class title.